No one likes labels – we all say. Unless, that is – it’s for your stuff so you don’t lose it! Then we all looove labels. Especially for Back to School. Labels make me thing of getting ready for camp. I can still vividly see the white labels with my name in a black block font. 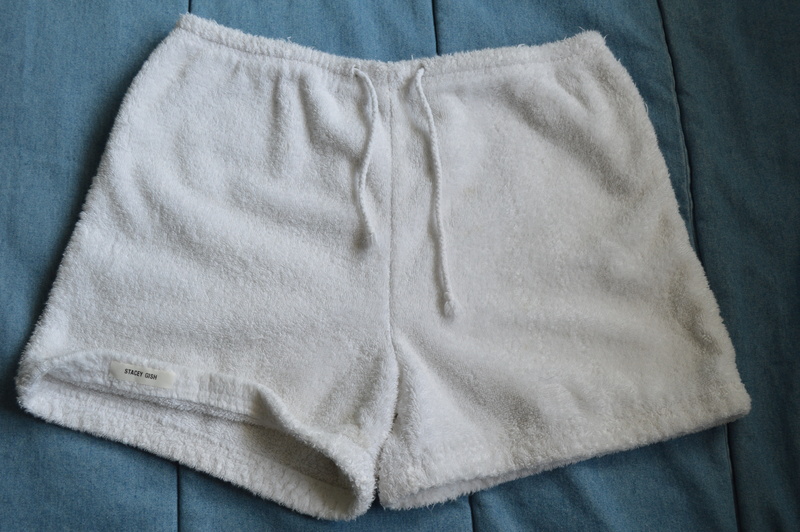 No, I mean I can LITERALLY still see them – hmmm I guess it’s time for some new clothes… But my terry cloth shorts are my favorite item of clothes ever! Anyway, I loved these labels because they meant several things. 1) I finally would have something printed with my name on it! (Since “Stacey” is spelled so many different ways finding items with the “E” was always a challenge – damn you Stacys!). Sometimes – if it was something I really wanted my mom would be ghetto fabulous & write an “E” in with a Sharpie. That was super cool… Not. 2) It meant we had to pull out the ironing board. I’m not quite sure why this was so exciting but seeing the ironing board in my house growing up was somewhat like spotting a unicorn. So I guess I thought it had mystical powers. 3) It meant camp was coming! And who doesn’t love camp? I LOVED camp. To me, labels and camp went hand in hand. There’s just something about labeling things that’s exciting (my husband is laughing at me right now). I guess it’s like when a dog marks its territory. Or why we all love to organize so much and then label what we organized. Try saying “The Container Store” without smiling. So you can imagine how excited I was when my oldest child came along and she was old enough to have stuff I could label. I found out about Mabel’s Labels before my daughter really needing anything labeled, however – she needed labels. Cute, girly, purple, princess labels. So I ordered some. Then I let them sit in a drawer until I could figure out what of hers to label. The labels were such good quality I didn’t want to waste one on something temporary. I finally decided – her snack cup, that we began carrying with us everywhere – was the perfect candidate. 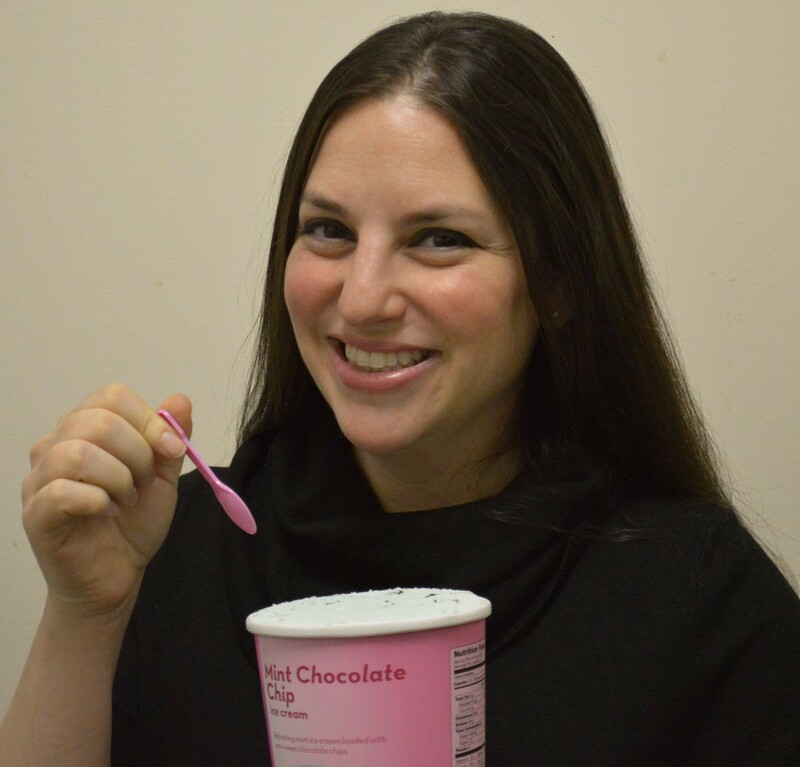 Let me tell you – it was a defining moment in my “mom-ness” placing that first label on. Ah—good memories. I had such pride when people would compliment it (yes, people complimented the label because it was so cute!). The best part was – it was self adhesive! No unicorn ironing board needed (the advances in labels since 1991 are quite astounding). I should mention we ran that sucker through the dishwasher countless times and the label still looked fresh and new. Fast forward a few years and my daughter has been to camp and school. Her Mabel’s Labels pattern has evolved with her and now since she’s big time and going into Pre-K, we upgraded to a purple tiara label from the Ultimate Back to School Combo. 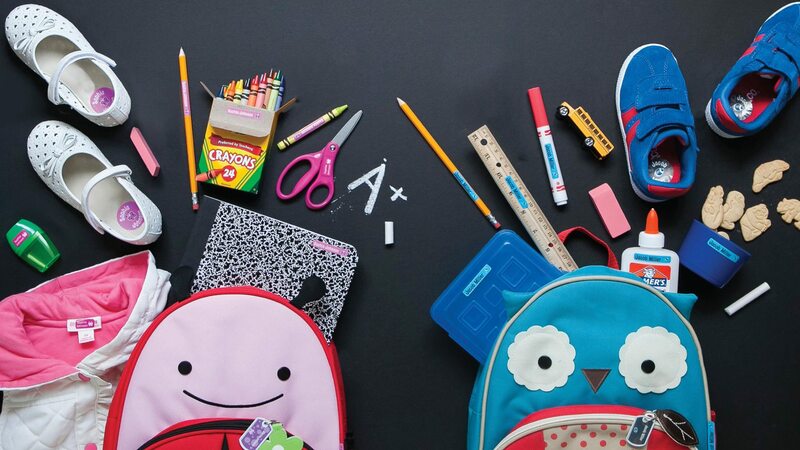 This limited time (available only until September 30th) bestselling kids’ school label combo pack includes all the durable, waterproof labels needed to keep belongings out of the lost and found. There are 4 limited edition solid palettes or 40+ multi-colored designs, plus 3 special back-to-school motifs (bus, books and apple)! I’m most excited to label her shoes with the round Shoe Labels. If your child sways more towards the sophisticated side you will love Mabel’s Labels brand new Stylish Scholars Combo for back to school. It features a range of modern, refined, stylish designs perfect for scholars of all ages. Use these sophisticated labels on school supplies, water bottles, electronics – like tablets, chargers or cell phone cases – and much more! I chose these for my son – in the blue “Camo” pattern. At nine months he leans much more towards Frank Lloyd Wright. You can’t go wrong with either pack for all of your back to school, daycare, or even second session of camp needs. The best part is – they won’t go stale! Stock up now if you love a pattern so you can have them for next year too. Both packs come with 40 Skinny-Minis™ (dishwasher and microwave safe, 1-1/2″ x 5/16″), 50 Tag Mates™ (washer and dryer safe, 13/16″ x 3/8″), 16 Shoe Labels (waterproof and UV resistant, 1.3″) & 2 Teeny Tags™ (waterproof and UV resistant, 1-1/4″ x 3/4″) and are $42. Thank you Mabel’s Labels for introducing me to a useful, reliable & fun product. You have become one of my favorite things! *GIVEAWAY* Mabel’s Labels has offered to give away a Stylish Scholars Combo to one lucky reader! Winner will be chosen Thursday, August 14th. 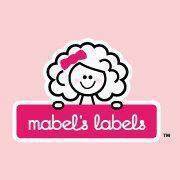 Mabel’s Labels was started in 2003 by four moms (Julie Cole, Julie Ellis, Cynthia Esp, Tricia Mumby) who were frustrated by their children’s belongings leaving home and not coming back. 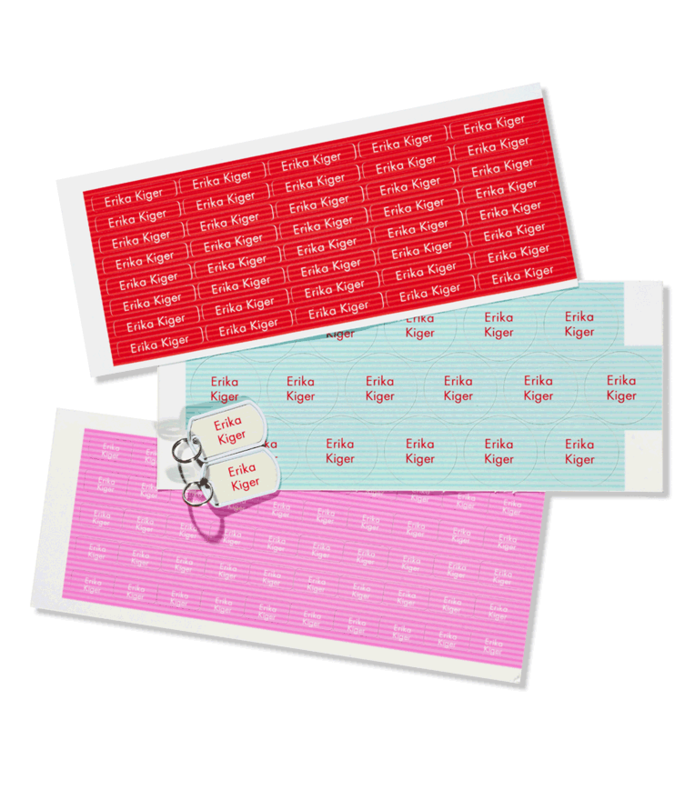 They decided to create the very best personalized, waterproof, name labels and tags possible. They’ve built on this commitment to excellence over the years and now feature child safety products, household labels and seasonal items as well. It is not surprising these fantastic labels have won: the 2007 SavvyMom “Mom Entrepreneur of the Year”, “Best Product” from Baby Gizmo, iParenting and PTPA Media, and a 2009 Royal Bank of Canada Women Entrepreneur Award; and have been featured on The View, Today, The Early Show, Rachael Ray, LIVE! with Regis and Kelly, Parents, In Style, The Washington Post, Huffington Post, People.com, Forbes.com and countless blogs and websites. Mabel’s Labels is listed on Inc.com’s list of ‘20 Awesome Facebook Fan Pages’ and Hubspot’s ‘The 15 Best Facebook Pages You’ve Ever Seen’. Plus they have a big celebrity mom following! What’s also nice is the founding moms are still involved and are sought-after experts on social media. Labeling Pens, so they don’t get taken at my old office. I love labels! I have labelled my son’s lunch containers so that they will come home. Oh, and his shoes. I love labels! I’ve started labeling the kids’ underwear, which seems super funny to me, as I really hope they are keeping their underwear on, at least most of the day. And if it’s kept on, a label would be unnecessary, right? My kids’ identical water bottles. I buy the same ones so they don’t fight over color/designs but then I can’t tell which bottle goes with which kid! I label my son’s change of clothes for camp, then label the plastic bag I put them in, and then label the bookbag in which I place the plastic bag. If I could find more things of his to label before sending him out the door, I would. Thank you everyone for commenting! The winner is Cara! My guess is the labels go in the underwear for when they go swimming – ha! Love it.